The meeting on the Prospect of EU-China Urbanisation Cooperation, co-organized by the China-Europa Forum (CEF) and the China Centre for Urban Development (CCUD), with support from the DG Energy of the European Commission, was held in Shanghai on 31 March within the framework of the “2013 China International Urbanisation Forum”. 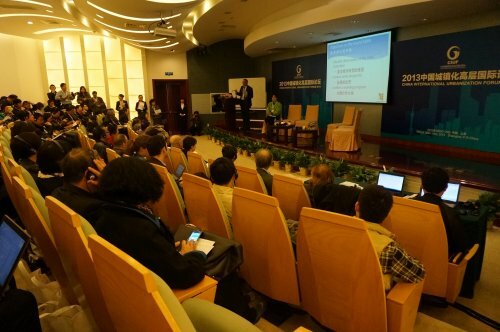 More than a hundred participants (government officials, mayors, urban experts, scholars, civilian representatives and entrepreneurs) from Europe and China attended the event to discuss problems faced by China and Europe in terms of urbanisation and ways of dealing with these challenges. During the meeting, the following 21 European and Chinese urban experts presented case studies and shared experiences based on their own knowledge, research and practices: Pierre Calame, President of the China-Europa Forum Foundation; MA Li, Deputy Inspector, the Foreign Affairs Division of the National Development and Reform Commission(NDRC); Pedro Ballesteros, International relations Officer, DG Energy, the European Union; QIU Aijun, Deputy Director General, China Center for Urban Development, NDRC; TANG Huadong, Vice Mayor, Qiqihqr City, Heilongjiang Province; Jacques Saint Marc, Deputy delegate of the French Inter-ministerial Steering Committee; Renbiao ZHANG, Professor, School of Political Science and International Relations, Director, Urban Sociology Institute, Tongji University; Pascaline Gaborit, Director, the European New Towns Platform (ENTP); ZHANG Jun, Associate Professor, Dr. Department of Sociology, Tongji University ; Maurizio Mariani, President of the Consortium Risteco, Italy; TANG Xuewen, Secretary-General of the Chinese Society of Foreign Agricultural Economy; Hervé Philippe, CEO of LPDA; Haixiao PAN, Professor, Department of Urban Planning, Tongji University; Pierre Bauby, President of the Reconstruire l’action publique（RAP）; Guang CHEN, Professor, Dean of School of Public Administration, Southwest Jiaotong University ; Matilda Sanden, Second secretary, Embassy of Sweden ; XIE Zhongyan, Secretary of Party Work Committee, administrative Committee of Changbaishan Nature Reserve, Jilin Province; Jean René Brunetière, French Ministry of Ecology, Energy, Sustainable Development and Spatial Planning ; XIE Yang, former Deputy Director, Department of Rural Economy, Development Research Center, the State Council; Edouard Laurent, Project Manager, Swiss Federal Institute of Technology Lausanne (EPFL) and SHEN Chi, Director of the Institute of Planning, China Center for Urban Development, NDRC. Below the essential content of every speech given at the meeting on 31 March, 2013 Shanghai. First dimension, building a global community, I would like to call that the “anthropological revolution” because we have to learn how to manage the planet together, we have to learn to share the resources, we have to overcome the issue of national interests, it is a very deep change which will take a long time. Our China-Europa forum takes part in this effort by setting up a global dialogue between societies in order to tackle our common challenges. I call the second dimension the “revolution of responsibility”, the “ethical revolution”, because we have to deal with our impact on the rest of world, whether it is our individual impact or collective impact, and we have, from our personal consciousness up to global governance, to put responsibility at the core of our actions. The third change is a “revolution of governance “, we have to invent a way to manage our societies in order to cope with complexity, in order to build all together more unity and more diversity, and it is an extremely deep change. And last but not least, we need a new economic model, because our present model is unsustainable, cohesion relies on ever-growing consumption much beyond the limit of the planet. We have to invent a way to bring well-being to everybody through the respect of these limits. Cities will be at the forefront of this transition because the traditionally major actors, which are the states and the big companies, are not fit to address these new global challenges. And it is a paradox that in a new stage of globalisation it is at the level of cities and at the level of the global supply chain that we can find a new economy and a new coherence. This transition, though urgent it may be, will be very difficult and very long because it means changing our conceptual framework, thinking about the conventional wisdom of governance, or the conventional wisdom of economy. We have to make a major shift, some people call it a “paradigm shift “. We have to revise all our assumptions and this will be a common very difficult effort. It will be a multidimensional issue, we cannot expect to find a technical solution or a political solution or even a social solution we have to address very various issues. To address this variety of dimensions, a short roundtable is just a kind of shopping list, yet useful to have a glimpse on how many different entry points we need to tackle this major transition. So we will try to define the different dimensions of this transition, to review some ongoing experiences and prospects, and to think about a working program for our partnership in the future. Ms MA Li stated in her speech that in the past 10 years, China’s urbanisation rate has experienced an average annual increase of more than 1%, and that urban population increases of more than 10 million people each year. By the end of 2012, China’s urbanisation rate reached 52.6%; but from an international perspective, it is not only far below the level of the developed countries, such as Europe and the United States, but also below the world’s average level. Therefore, there is a huge development and upgrading space for China’s urbanisation. She said that the European urbanisation had started since the British Industrial Revolution in the mid-18th century, from which Europe has accumulated a wealth of experiences. However today, it faces new challenges. Despite its late start and many unresolved problems and the challenges ahead, China’s urbanisation is bringing enormous opportunities for development. The EU-China urbanisation cooperation conforms to the common interests of China and Europe. She finally concluded that both China and Europe are making efforts to promote the Joint Declaration on the China-EU Partnership on Urbanization, signed by Jose Manuel Barroso, President of the European Commission, and LI Keqiang, then Vice-Prime Minister of China on May 3, 2012. (…) The meeting was co-organized by the China Centre for Urban Development (CCUD) under the National Development and Reform Commission (NDRC) and the China-Europa Forum, with support from the DG Energy of the European Commission. She believed that this meeting would contribute to the sound development of the EU-China urbanisation partnership. I will give you a few points about the reason why cities are interesting, why Europe can provide an interesting experience and contribution to the urbanisation challenge in China and how we can get many mutual advantages out of our cooperation. I was before undertaking the so called Covenant of Mayors, it is one examples of what is going on more and more in the present world, now that problems are becoming very complex. We know what our dreams are, what our vision is, but we do not know how to get there. This globalisation, along with market pressure, pressure of the environment, lack of resources is very complex. I do not think there is any human mind able to find magic solutions any longer, indeed the times of big intellectual capacities of the 17th or 18th centuries are over, now we are in the times of big collective capacities, of big experimentations for solutions. One of the most important problems we face, all of us, is climate change. We have been negotiating for years on climate change and we have always failed to negotiate anything because basically at the government level we negotiate with economics in mind, but climate change and economics do not fit very well together. At a certain point the European Union decided unilaterally that we should reduce by 20 % our CO2 emissions. We suggested this to the rest of the world with no condition and we went for it because it was fair as we have higher CO2 emissions. Committing to reduce our CO2 emissions entailed a lot of changes in our lives and the European Union very soon realized that this commitment, if it was going to be achieved, needed a very active involvement of the local authorities. Indeed most of our energy consumption comes from our houses, our buildings, our mobility etc, and it was necessary to take that into account. The idea was to try to work in coordination. We were simply telling cities « Would you like to come with a compromise to reduce your own CO2 emissions? We pay no money, we give nothing simply a covenant, a compromise saying: I will cut my CO2 emissions by 20 % by the year 2020 in these sectors ». And to our surprise many cities said : “yes, we go for it “, and they are going for it, there are some great cases. We excluded industry from the action in the Covenant of mayors, because industry is something subjected to global competition, to global market, When you decide to concentrate on industry in a country, basically you are deciding to live according to the wishes of other people, the people who are buying your products. But I want people in the cities to think about their own city, then you do not have to think about the industry; you have to think about your buildings, about your public spaces, about urban transportation, about how you live and how you see your own point of living. Put industry aside and you will have a completely different picture. When addressing climate change, including industry means that we need to invest more because we are less competitive, and we are going to lose jobs etc. If you exclude industry, then there is no global market, there is no competition, it is only about thinking about yourself, and loving your territory. And all mayors said: “yes! I want to fight climate change, yes I want to reduce CO2 emissions, yes I want clean buildings and clean transportation in my city”. It is a win-win situation. This is what we did with the Covenant, we realized that it is easier to involve the people. Money does not matter, it does not matter if it is a rich or a poor city. Now in the Covenant of Mayor there are 4800 cities in 48 countries. There is the city of London, a very rich, financial centre, and there is the city of Ploiești in Romania, in which there are very few cars, and still people riding horses, but both of them have shared objectives. (…) This is what is the Covenant, this is something that we can share because for us a Chinese city that is clean, in which the people are smiling, in which people look at each other and have public spaces to eat together, to walk together, in which there are opportunities for job, in which the quality of the houses is good, is something that is the best possible thing that can happen in China. It is in our interest to do this. It is not in your interest that China is producing IPhone, But it is definitely in your interest that Chinese cities and inter-cities are living with clean air, clean water, in good houses, and recycling waste. And on top of that we need, all of us, China to have a reduced demand of energy, of oil, of many resources that are in the world or other things that are not necessary in order to have more for all of us. We have a long experience in urbanization, whether it is good or bad experiences, but I do not want to make any judgment of value on this. I only come here to say that our interest is to say: “European cities are interested in sharing with you these experiences “. We should consider problems we face now, problems that China faces now with urbanization as a golden opportunity to change our perspective and look at it not with a macroeconomic perspective and with a top-down approach, but maybe with a little bit of love. If we can do that in the process of urbanization, then people will get together. And this is what urbanization is people getting together and getting together in the right conditions, with the right context, and in a clean environment. I think it is the best thing we can do together. We have done this in several cities in Europe, we paid a lot of attention to indications on what really matters which is: how many days do you feel well? How many people are smiling in the street? How many opportunities are there for your children in your city? These are the important things. In her speech, Ms QIU Aijun made an introduction to the report China’s urbanisation: trends, challenges and policy suggestions. She analysed the situations of the economic and urban development of China’s different regions, and summarized a few big differences : the regional differences of economic efficiency and of educational attainment patterns, the regional distribution of population, the spatial pattern of population, and the regional differences of urbanisation rate. She highlighted measures for improving the quality of urbanisation and enabling the migrant population to enjoy the same rights as other city dwellers. She pointed out that China’s urbanisation faces many challenges, the biggest one being the population issue. In 2010, on the basis of resident population statistics, the urbanisation rate was 49.95%, but the proportion of non-agricultural household population accounted for only 34.17%. This gap might be the passive urbanisation or semi-urbanisation mentioned by some scholars. The second challenge is the one of “differentiated” public services; the third, the issue of the extensive use of urban and rural construction lands; the fourth, the inequality of opportunities for small and medium-sized cities and small towns. In China, cities have different administrative levels. Cities at different administrative levels have different levels of power and responsibilities, and the extent of land expansion differs from one another. Towns are under the governance of the counties, while counties are under the governance of the prefecture-level cities. The higher the administrative level, the more resources the city can control. Another priority is the demand of urban public services. The level of public services for the urban population is higher than that of the migrant population. The solution to this is not to depress the higher part, but to improve the lower part, which means more spending on public services. More attention should be paid to the issue of where and in what way this expenditure should be provided. In terms of the reform of household registration system, the most important point is to establish urban and rural integration, and to gradually remove the links between household registration and urban welfare system, thus making a more integrated urban and rural welfare system. In addition, it is also necessary to reduce the intervention of the administrative level on the allocation of resources, especially to make reasonable use and optimize the allocation of resources among cities and towns at different levels. Besides, it is also a necessity to break the barrier of the administrative division. In this regard, the focus is on how to build and use the cross-regional infrastructure. The EU has a lot of good experiences, for example, the EU Structural Funds provides shared infrastructure among the different countries and cities in the European Union. Such experiences is helpful. Finally, it is essential to increase efforts to support small and medium-sized cities. Small and medium-sized cities and towns in Europe enjoyed a fast development, offering a lot of good experiences for China to learn from. With about 20,000 small towns, China also had a great deal of knowledge and experiences to share. This should be an important aspect in the EU-China urbanisation cooperation. I would like to share briefly with you some lessons driven from international experiences. As you may know, since the first Earth Summit, there has been a great lot of networks of cities working together on this issue of a transition towards sustainable societies. In fact we are still at the first stages of a long march towards real sustainability and we will need all the efforts of the networks and a strengthening of their exchange of experience. Exchange of experience already exists but not so much as it should be, there is not enough critical reflexion of mutual experience, this is a challenge for our partnership between China and Europe on urbanization. Although we are still at the first stages we can nevertheless draw some conclusions of what are the most important perspectives but also what are the main obstacles we are facing. First of all we need to understand the urban metabolism. In fact, cities themselves do not know exactly how they function. They have a very limited knowledge of their metabolism, of the flows of energy, information, and money going in, and how inputs are transformed locally, create or not prosperity or go away. When you look at the consumption in Europe, you can see that there is a focus on the immediate consumption of energy like in housing or transportation, but a very little knowledge of what are the natural resources, what is the energy embodied in the process of creating, transporting and distributing products that you buy. So the first conclusion is: we need to understand much more about cities’ metabolism, we need new institutional arrangements, we need much more research to really understand it. Second, change can not be the result of a political will; it needs to involve all the stakeholders. All the success stories we see show that it is under the condition of the population itself being really conscious of the issue of sustainability, and really involved in it, that you can really change things. Starting from a top-down process will lead you nowhere, you will of course create good housing and good transportation but there will be resistance emerging from the population. We need growing consciousness, many social innovations and we have to help them to be coordinated, combined. This is an effort coming from the whole society, not only from the political body, not only from companies or else. The third point about governance is the following one: no issue can be solved at one level. Unfortunately according to the conventional wisdom about governance we should know who is doing what, and be able to describe exclusive competencies for each level, but this does not work anymore. The challenge now, is to invent what has been well described in the white paper of the Committee of Region of Europe: a multi-level governance. The key issue now is how the different levels are coordinated with each other. If you think of energy, of social cohesion, of whatever is related to sustainability, then you will realize that you need to combine the efforts of different levels. And it is a great change in the conception of governance, in the conception of the role of the public servants and in the way to reach more unity with more diversity. Fourth Point: next to the multi-stakeholders efforts you have to understand that common good cannot only be produced by public services. Common good is the result of a co-construction and therefore many efforts are made nowadays to define co-responsibilities. A very good example is the one about children. Children are very conscious of the shortcomings of our present model of development, they want to be responsible but they are not at the local authorities’ place, they are not at the place of the education system. Only if you can define co-responsibility between children themselves (and they want to take responsibilities), the education system and the local authorities, will you make a dramatic move forward. So co-responsibility and co-responsibility charters are extremely important. Fifth point, it is not possible to conceive sustainable cities with unsustainable supply chains, because you remain dependent on a consumption which is unsustainable. So the two major institutional arrangements needed for the future are on one side cities, on the other side global supply chains. You will have, during the roundtable, a very concrete example about food supply chain. Sixth dimension, we need to create an appropriate governance regime for energy and for non-renewable resources. Right now we want to hammer screws and we want to screw nails and it is exactly what we are doing with our regulations. They are inappropriate to the very nature of the different categories of good and services. Therefore a major social, institutional and political innovation, will be to invent a governance regime for supplies. And we know that here in China, there is a dramatic problem for water, for energy and for non-renewable resources. In the next decade, the conception of money, of currency itself will change dramatically. We are only at the eve of the invention of this new regime. Seventh dimension, we need to understand irreversible long-term decisions, when you accept the urban sprawl, when you create big infrastructures for cars, then it will be there for one hundred years. In Europe for example, only 1 % of the housing stock is new each year. So let’s think about the inertia of everything we have built over the last decades, and this is very difficult to transform. When you make a decision today it implies the question of sustainability in 50 years. This is the contradiction that European cities are presently facing. One on side they really want to move towards sustainability, but they inherit decisions that have been taken in the 60s and 70s and it will be very difficult to go back. All the evidences that we have of successful cities is that they overcome the division between political parties, because it can take a 10 to 15 years strategy to really move towards sustainability. So if each time there is a change at the political leadership level it will create a change in strategy, then you will go nowhere and it is a challenge for democracy itself. Eighth point: developing a new vision of cities and city planning. We have a mechanical vision of the conception of cities, it can be seen whenever you go through the streets. We have to move to conceiving cities as ecosystems, complex biological systems. We have to make a clear divide between strategy and planning. Planning is rigid, much too heavy, mechanical, so when dealing with resilience, with adaptation, with managing a relationship then the pattern can be changed. And finally, ninth point, integrating technical progress in this new vision. Technical progress will be useful, smart cities are useful. We can use an important number of data to help manage mobility or manage heating systems of houses and so on. But this will not be sufficient, changes have to incorporate new technology in the new vision, otherwise you go nowhere. These are the main lines of conclusion drawn from international experience nowadays. In the very beginning of his speech, Mr TANG Huadong shared his reflections on the creation of a new mode of economic development. Was the historic process of primitive society - agricultural society - industrial society - modern society inevitable or could it be jumped over? In today’s society, is the development of urbanisation bound to go through the process of industrialization? Is it possible to go from an agricultural society to an ecologically civilized society? Some places are exploring the development of eco-economy, which could not only promote economic development, but also bring ecological benefits. Qiqihar developed six measures to promote further urbanisation: first, the re-construction of the city centre, the expansion of the new urban area, and the refurbishment of the old urban area; second, the construction of a satellite city, with the county as the satellite city of the central urban area and as the mother city of the surrounding small towns; third, the promotion of small towns with distinctive features; fourth, the provision of industrial support — introducing big companies and large-scale green industries — to promote the overall urbanisation; fifth, the development of rural cooperatives, the vast area of land and the small population in Qiqihar offers good conditions to develop a large scale operation, and the development of rural cooperatives could boost the urban development; sixth, the provision of a variety of security measures, including a dynamic development of education, to attract, for example, the rural population, by allowing their children to go to school in the city. In addition, he thought that Qiqihar could be the first city in China to abolish the household registration system or to remove the added-values of urban welfare to the household registration system, because the farmers are rich and can afford urban lives, thus not becoming a burden for the city. People coming from rural areas would also be a driving force for the development of the city . In 1800 we were 1 billion on this planet, now we are 7 and in 20 years we will be 9 billions , so there is a question about land use. More and more people are going to live in cities, in 2050 we could have an urbanization rate of more than 60 %. So the question for urban planners is cities or urbanization? There is a difference. Daily services should be at walking distance and there should be a good transportation system. For example, Lyon a city in east-central France is involved in a new development model. The city has around 1 million inhabitants and in the whole area, with the suburbs, there are around 3 million inhabitants. The perimeter of the urban community of Lyon, also known as ”Grand Lyon” and the study area is of 30 km. Understanding what has happened will give us a very large area of study in the field of urbanization. Before in France, around big cities there was a lot of this kind of houses and you had to spend a lot of land and of course energy for it. We can also observe that the rate of motorization in this area increased a lot since 1982. In 1999 the number of personal cars skyrocketed, it is part of the urbanization process. In these little cities around Lyon there is more than 1.5 cars per family. Now the new way of urbanization is this way: an urban community like the ”Grand Lyon” surrounded by a lot of little cities, a lot of small and medium cities with all the daily services . There are projects to build new districts inside the city and to make the city greener by making the forest enter the city. There is another project of public transportation. The tramway should come in the old part of the city to facilitate access to daily services and facilities. Which kind of urbanization do we need to have a high quality of life, a high quality of air and so on? When I was a young urban planner Brasilia was a model for us, there is also another model in France, the one of La Défense, separating the working area from the traffic area. Another example is the one of a city in Ningxia province, the distance between the old city and the suburban area is 50 km. In the old city, there is a lot of life in the streets, in the newest area buildings are very comfortable but to access other services you need to take a car, or a bus and spend a lot of time, money and energy. I will touch upon the issue of The New Concept of Space in Urbanisation: from “Geographical-Physical-Economic Space” to “Cultural-Psychological-Public Space”. In China, cities and towns are two different concepts. China is now stressing the coordinated development of large, small and medium-sized cities and towns (so-called new urbanisation in China) proposed by the 18th National Congress of the Communist Party of China instead of the emphasis on the development of cities proposed by the 17th National Congress of the Communist Party of China. The traditional concept of urbanisation takes agglomeration as a symbol, and transfer of population is a kind of agglomeration, but in the process of new urbanisation, China must pay attention to the issue of quality. Enabling the urban civilization to radiate to the rural area, enabling the vast rural areas to share the achievements of reform and opening up, are the significance of the new urbanisation. As a result, urbanisation should not be either a movement of destroying the rural area, or an issue of simply changing the agricultural land into urban land. Of course, it is also necessary to consider the psychological changes of homogenization of the rural society and heterogenization of the urban society brought by urbanisation. What are the features of China’s urbanisation? First, the dual structure; second, the pressure of the equalization of public services; third, the land acquisition and relocation, because China’s land is either state owned or collectively owned, the relocation tends to cause various social conflicts; fourth, the emergence of new challenges, including low-carbon issues, environmental protection and resource conservation. Problems faced by China’s urbanisation include: its speed and scale, the separation of industrialization from urbanisation; the gap between regional developments; the disappearance of a city’s characteristics; the land waste of small cities and towns; the land shortage of developed cities; an increase of small towns in number but with an overall poor quality; the interference and impact of the administrative system and so on. First, urbanisation should not be launched everywhere, and new cities should not be built everywhere; second, urbanisation should not lead to the similarities of cities, so-called “thousands cities with the same face”; third, urbanisation should not simply be reduced to a real estate movement; fourth, urbanisation should go far beyond a change in the household registration. Some people proposed that there are three problems in urbanisation: first, where should the population move to? Second, where should the money come from? third, how should the land be used? Is the urbanisation of land equivalent to the urbanisation of people? Large cities have the advantages of employment attractiveness and high absorption capacity of people, but lack the basic existence force because of the limited resources, while small towns have the population existence force, but lack the employment attractiveness. I will propose a few simple ideas on urban development, the first is the positioning issue of urban development, and the second is the residential segregation. As a social science researcher, I am particularly concerned about whether people coming into cities can enjoy a citizen treatment / can be considered as real citizens. “Migrant worker” - a temporary transitional name - seems to become the eternal symbol of a social status, which is worthy of our consideration. This relates to the settlement issue of the city. For instance, the United Kingdom made great achievements in public administration during the period when Margaret Thatcher was the Prime Minister, but it also encountered a lot of problems. In the past, Paris constructed a new city mode in order to settle a large number of Arab immigrants. At present, with an increasing number of low-income people expanding to its outer edge, would Shanghai experience similar riots as Paris did? Europe has cultural conflicts, while China has a problem of differentiated place of birth. Modern urbanisation development has three basic principles. First, in terms of physical-geographical space, we have to go beyond the technology-orientation, and return to the people-orientation. Second, in terms of economic-political space, we have to abandon the consumerism, and try to achieve sustainable development. Third, in terms of cultural-mental space, we have to resolve cultural conflicts before answering urban and rural issues. It needs our efforts from now on, starting from everyone’s individual effort. The challenges of urbanization are tremendous. Cities have created on the one hand better lives for citizens, better work, better housing conditions, better entertainments but on the other hand they also created and lead to what some international expert schools call ”serious urban diseases”, namely : increasing house prices, traffic congestion, security issues, unlimited city areas and last but not least, huge air pollution. In this context, some decision makers decide to create new towns or new districts, through these initiatives, they want to achieve a more balanced territory and to create better areas for citizens. However if creating a city or a district from scratch can be seen as a dream for decision makers and urban planners it can also turn, sometimes, into a more difficult issue. The risk is indeed to create ghost cities, empty cities, dormitory cities. So in a time of a really quick pace and of huge scale urbanization with land resources, water shortage, this question of building new cities is really a huge decision, having an impact on territories and on land resources. These decisions are also costly because resources are needed. MR. Schwab said that when you build a road, it has an impact for 1 thousand years, this is the same when you build a landmark, it will last for centuries, but what if you build a new building? How long is the lifetime of this building? Is it better to build in sustainable, long-term concrete or is it better to build with a lot of eco-materials buildings that will have a shorter lifetime? Urban experts do not agree on what is better and of course different cities need to find a different local solutions. I am working with European new towns. European new towns were built 60 or 40 years ago for the youngest ones. They were at that time pilot cities and we can learn a lot about them. They were built from governmental decision and quite quickly for European standards. We can observe that they were built for the use of cars with mainly large roads and not a lot of public transportation. Density was not really high, because there was this idea of garden city at that time. Time changed and after some decades they started to build a public transportation network, to take the ageing of the population into account to think about economy. So we have tried to identify some key points about new towns and new districts that are important to take into account. The first one is the question of employment and jobs because building new cities is not only about providing housing this is also about bringing some jobs, that is what we call a ”housing-job” ratio. It means that when you build one housing unit, you need to have one job. But this does not solve the problem, because when you build an entire new area what type of economy are you going to bring on your territory? Will you attract huge industries, raising the question of pollution, the question of use of territory? Will it be retail industries, cultural industries, high-tech industries? All these choices are difficult to make for local authorities. The second point will be to include the maintenance of buildings. Third point prospective, take into account the changes of society, like the ageing of population, concretely; having elevators in buildings otherwise old people cannot reach their home, having accessibility, which means having public services, schools, workplaces, close from citizens along with a good transportation network. And, fourth point to avoid the speculation and empty buildings, because, often , when you have a new town, a lot of investors will buy many buildings, and wait for prices to go up. In the meantime these offices will remain empty and this does not really create a good living environment for the people. We often try to think: what is a successful city? What is a successful new town? What is a town which is good for living? What is a town that provides enough services? Only people can answer these questions. When creating a new area, having all these services and all these liveable areas in one place makes it a bit more of a challenge. Also, another trend is to discuss about eco-areas and eco-neighborhood. In Europe, most of the time when we really try to build ecological neighborhoods, we address cases at a small level, we do not really have a larger development scale. Achieving real urban sustainability, injecting vitality in economy and society in a time of economic crisis, creating green belts in our cities that are also the lungs of our urban area is a challenge even at the European level. At ENTP we have an interesting project, called the EAST project, Euro-Asia Sustainable Towns, which is a project of cooperation between towns in Europe like Basildon in England and Naya Raipur in India, and different Chinese towns such as Qingpu and Baoshan. We try to discuss about what the key factors of sustainability are for these newly developed towns. We have tried to identify some of them, like education, environment, clean transportation, urban sprawl, absence of polluting industry but also analysis of risk for instance which is very important for the long term. In the end what we promote is to try to have and integrated vision of planning, to take all the aspects into account at the moment of planning. To conclude with, there is no magic recipe to create a new town or a new district, every solution is different. And here are the issues that can be identified: how to promote these environmental cities? How to address social cohesion issues? How to address the issue of economy in the city? And how to address the issue of governance and city management? The title of my speech is Study on Public Leisure Space and Community Building. In the process of urbanisation, urban cells – communities – should be particularly developed. Especially after the reform and opening up in 1978, how should we develop urban communities in the process of a transition towards market-orientated urban management? In the past, it was the work unit or danwei (a name given to a place of employment in China) that built communities, but now the function of the work unit or danwei has been transferred to the hands of neighbourhood committee. The purpose in the past was to control communities, while nowadays it is to provide social services. Communities in Shanghai have established a mode of “two levels of governments, three levels of management and four levels of network”, which provides a good support for our social services. Nevertheless it is generally believed that communities are still developed in administrative means and influenced by government forces, while resident-based communities are underdeveloped. Is there any community in China’s cities? At present, the average life expectancy in Shanghai is 80 years old, while the average retirement age is less than 60 years old. There are still 25-30 years for those retired people to spend in the community till their death. How should such a long time be spent in the community? Urban population density in China is increasing, but living space for residents is very limited, thus leading to various problems, such as the lack of public space, the decrease of family scale, and an increased number of empty-nest families and elderly people living alone. After retirement, the majority of people no longer belong to any work unit or danwei. They have to return to their own residential communities where space is needed as a carrier for their activities, but how do we find such a carrier? Residents have created many different ones, for example it is common to see elderly people in Shanghai dance and sing in public places. Why do people need such natural space? We did some field surveys and found out that it was because of the general demand for green space and open space. China’s cities are very densely populated areas - people do not have much green space to enjoy at home, or enough open space to invite friends at home. In response to this reality, we proposed Space Reshaping and Social Reconstruction. On the one hand, modern communities of Chinese cities lack basic public space and a social mechanism for nurturing communities, while on the other hand people have a demand for public space. Therefore, we have proposed to construct a social network on the basis of public space features, in order to promote social development. I would like to share a successful case: the one of The Knowledge and Innovation Community (KIC) which is a comprehensive premise near Fudan University and Shanghai University of Finance and Economics. The surrounding old residential communities have little public space, while the new office space of the KIC lacks popularity, energy and vitality. As a result, the KIC constructed a lot of public spaces for nearby residents in its office area. It has thus become a safe and healthy space for social interaction. This practice has offset the problem of the old community’s lack of open space. Such community with a linkage of public space has great vitality. Should smart cities exist without smart food policy? Our dialogue with Chinese institutions and Chinese organisation started in 2007, it is now quite 7 years that we are working together to force sustainability into the food supply chain in China and also in Europe. Just a few key facts and numbers to better understand big food supply chains and how strategic it is for a city to take it into consideration. Only in Europe, for one meal eaten out of home we produce 250g of waste, and in Europe some people are having a meal out almost everyday. We are only talking about the food service which, in the total of around 23 million tons of CO2 emissions related to waste accounts now for 12 million tons. Food consumption is growing everywhere. What we need is a systemic vision of the food value chains to reduce gas emissions of the entire supply chain. We talked about life cycle assessment of the food supply chain, we need to reduce needs of water and energy, base the food system more on seasonal products and vegetables proteins and maybe less on meat proteins, animal proteins. It is one of the necessities for cultural change. These are some key points of the new food paradigm. According to a LCA analysis made over public food services in Europe we should produce from 4.6 up to 7 kg of CO2 equivalent per meals (this is only in logistic terms, we do not talk about ingredients), and we should have 2 vegetarian meals, of 2 kg of CO2 emissions per meal. The gap between the worst one and the good one is around 5 kg of CO2 emissions per meal. This case study comes from Italy but it is the same everywhere in Europe, in the main fields of the agri-food supply chain: namely industry, public food service wholesale and distribution. With some colleagues we did some research on fish and on the annual catch of fish in the world. It is around 60 million tons and it is shared between large scale fishermen and small scale fishermen. Talking about human labour, we can assume that large scale fishermen account for about half a million people working for the same quantity of fish as artisanal fishermen which account for 12 million jobs. We can also observe that fuel consumption is less with artisanal fishing. Until today business activities have traditionally been taking into account 3 different resources: financial, technical and human resources. We hope that from tomorrow onwards human labour is put again at the centre of the economy. Environment must also be taken into consideration since the first 3 ones are not endless resources. Some suggestions are to use taxation as a lever to encourage the development of an innovative and sustainable food processing system run by the younger generation and capable of producing healthy and tasty food for citizens in harmony and in symbiosis with the territory itself. There is no smart city without food policy as software and food logistic hubs as hardware to create this symbiosis between rural and urban area in a clever and sustainable way. Eating City Platform is a series of activities we have conducted since 2007. We also published a series of papers and publications, which has benefited from the support of the China-Europa Forum (CEF). We have conducted research on sustainable food supply chain under the framework of the CEF’s WT35 workshop. In China, we have established a more flexible and sustainable research networks. “Eating City” is actually a new platform evolving from the CEF. Just now, Mr. Maurizio Mariani talked about the eating problems faced by cities in developed countries. China also has such problems, and of course, our food safety issues may be more serious. I think that in the China-EU comparison on urbanisation, even though both sides have some common features, it is necessary to note that the two sides have different backgrounds. In the specific context of China’s rapid urbanisation, there are, in fact, a lot of things that could be done for the sustainability of the Eating City Platform, such as how to solve the problem of urban residents’ distrust on food safety. I would like to suggest to establish a food safety inspection and testing institution with the participation of the government and multiple parties; If a consumer is worried about safety of a particular food, he or she could send the food to this institution and pay a very small amount of fees to have it tested. Most of the cost would be borne by this institution. Maybe this could exert heavy pressure on food production and processing enterprises, and could effectively promote urban food safety. In addition, what could all of participants from China and Europe do by working together? Because of the limitations of my organisation - the Chinese Academy of Social Sciences, (CASS) - it is relatively difficult to implement a lot of ideas. For example, we believe that it is possible to establish a platform of collective procurement of safe food for cities’ primary schools, kindergartens and other important work units that have public canteens, which may help to promote sustainability of urban food. With the platform of the CEF, if some cities or new towns are willing to participate in the construction of “urban public eating platform”, I think it would be a very good idea. To conclude, I would like to remind you about the quantity of food waste and of food losses we have all over the world, it represent around 13 billion tons per year and the value of food losses and waste is rising up to one thousand billion dollars. The most incredible thing is that we also have around 1 billion of overweight people around the world. We produce much more food than what we need, and we should shift this paradigm. Our common future with our Chinese colleagues it is to make an international win-win cooperation to face food challenges because in both Europe and China food is a global issue at a local level. We must take food into consideration when we design a new city or when we talk about smart cities, we should also create a kind of food dashboard to better understand flows of food arriving in a city. By sharing experience with our colleagues we are now assessing new metrics and new indicators to include food sustainability into smart cities. Pedro Ballesteros: I would like to open the floor for any possible questions comments that may rise from the audience. Question 1: I had a question about new towns, you said that it was very difficult for new towns to understand what kind of economy they want to attract and create whether it is high-tech industries or cultural economies. So how can new towns actually decide which economies they want? All the new cities and new towns are mostly focusing on high growth industry, green-tech and bio-industry. Is that how they should just choose? Basically say: “these are the latest high growth economies then we should focus on these”? Because then every city is going to do the same thing and competition is going to rise higher and higher between these new cities. Pascaline Gaborit: This is a difficult question of course because all new towns want to attract high-tech industries, they all want to have hubs, clusters and a competitive economy. However probably there are solutions in the diversification of economy: SMEs, creative industries for example; and not only dependence on one sector especially if it is manufacturing or logistics sectors, sectors highly sensitive to the crisis. Question 2: The new towns you have just introduced also have new technologies, are European new towns employment-oriented or residence-oriented, or both? Since the reform and opening up in 1978, all the development zones in China have only industries without residence. At present, each development zone wants to expand, because there was no rational allocation of employment and residence at the time of its construction. As a result, the urban expansion has become an important task for all levels of government, and each development zone would probably expand into a city. Does Europe have any experience in this regard? Pascaline Gaborit: Yes exactly this is a real question, if you create a development zone and you create the housing part afterwards you also create problems of city sprawl, you use a lot of your land, of your resources and you create a mono-functional type of city depending on your business park. How to integrate these developments in your city, in a real city where citizens live and work is a real question. Pedro Ballesteros: A philosopher once said that “very often the most difficult thing is not to do” and I think that sometimes with cities and new cities there is an excess of doing. A city does not need a purpose; a city is a place where people live. The purpose of our life is our business not the business of the city planner. The city planner has to take care that we are able to develop our purposes. All cities in Europe that were created around a certain industry development, produced generations of happy people during a certain period of time and after a while disappeared. Maybe we could think in organizing cities just for people to get together and develop their own activities. Question 3: I have two questions. First of all, in China’s urbanisation process, the competitiveness and efficiency of the major cities in the eastern coastal areas are getting higher and higher. At the same time we also hope to boost the development of many small cities and towns in the western region, but it has proved to be very difficult. Is there any similar situation in Europe, and how do you solve such problems? The second question is about food waste. In China, cheap prices of food are a very important reason for food waste. One problem resulting from cheap food is that farmers cannot benefit greatly from production of agricultural products, but the government is extremely concerned about it and takes measures to control the rising price of agricultural and sideline products, which has limited the restrictions on food waste. How do you deal with such problem? Maurizio Mariani: About the second question of food waste. I totally agree with you, we need to give value to food, and today with the financialisation of the food supply chain, with the industrialisation of the food supply chain we are losing jobs, and the price of the food is decreasing. I think it is a great opportunity to give value to the food, to create job into cities and in rural areas close to cities. And of course food waste is also coming from cultural reasons. In Western countries especially, we buy too much food, for example what is striking in a report on food waste and losses is that we lose the same quantity of food in non-developed countries and in developed countries. Where is the difference? In the developed countries waste occurs at the end of the supply chain, consumers are buying too much food, and in non-developed countries it is for a lack of technology of conservation that losses occur. The big issue of transfer of technology between countries also needs to be solved. Pedro Ballesteros: There are historical reasons as well. China is a very old country, but in Europe we have a different history. Germany is a very young country, less than 200 years, and Germany was a bunch of cities fighting against each other or helping each other depending on the moment and their sense of humor. And they created their own models. Italy, which is maybe the country of the most beautiful cities that you can see, was invented as a country only in 1860 because Italy was also a bunch of cities and all the developments came with a bottom-up approach. Each one of the cities was creating its own solution, some of them were failing, other would have it right and because of that we have this huge diversity today. We can offer a lot of experience because our history is based on extremely diverse bottom-up approaches, and we are proud of this. One thing that we can share with you is to try to entail this same feeling of diversity, you should not try to look for a single model because it is good that the people is looking for good solutions, different solutions, and if some of them are not good, it is not important, diversity is much more important. We do not have a model, we have what we found and what our people have in dream. Another example, the British Empire, it was created around one city, London, and France as well, around one city, Paris. You can see that on the same continent we have all these different models. In Spain, there was one city, Seville, that was the only port of entry for everything coming from America and this created the whole structure around the city, different from other cities. In China many years ago you also had this variety of models. Maybe it would be good to look back in books to see how the people thought at the time, then to speak with the people in different cities and allow different solutions to be experimented, applied, enjoyed, because maybe we are going to find there a lot of innovations and a lot of wonderful things that we could not imagine before. Pascaline Gaborit: I fully agree with you there is not one single model of city development. That is why we believe in city to city cooperation but each one with its different model. For example, we really believe in city to city cooperation among European cities and Chinese cities .They can learn so much from each other from these different models. ZHANG Renbiao: Talking about big cities and small towns, people are always yearning for cities that offer more opportunities. The reason why small towns of the central and western regions are difficult to develop is that there is a big regional gap in employment as the development of employment needs the service industry, and the enjoyment of services needs an increase in people’s income. These series of questions are interrelated, which is worth our consideration. In addition, China’s food prices continue to rise, however rising profits do not belong to farmers but to traders and retailers through intermediate links on the global supply chain. We could suggest that government should take necessary measures to control this. For example, some restaurants in Germany would charge additional treatment fee if one cannot finish all the ordered dishes. I think China should also promote such policies and practices to reduce food waste. This requires specific policies and cannot just rely on the general publicity. XIE Yang: The relatively low prices of agricultural products in China is a long-term problem, and is also an important factor of the low cost of labor for Chinese industrial products that are exported to the rest of the world. In 2008, when prices of agricultural products soared around the world, food prices in China were only half the price of the world average and this made China successfully go through the global financial crisis. This is the cornerstone of our cooperation with Italian partners led by Mr Maurizio Mariani. The focus of our project is to utilize and enhance the role of the peri-urban agricultural land. With the urban expansion, there is a significant reduction of vegetable plots and agricultural land in these areas, and many agricultural products sold in big cities are transported from far away. Therefore, we, together with our Italian partners, began to explore measures to recommend the government to promote and to subsidize the peri-urban areas and urban public products. For example, how do we make sure special subsidies are in place and enable public canteens of government bodies and schools to get green foods ? Question 4: Thank you all for the wonderful speeches, I have learned a lot. I have a question, there is an old saying in China that “people won’t get up early without benefit”. I would like to ask European speakers, from the European perspective, what benefits would you get from the urbanisation cooperation with China? What can you provide China with, in addition to experience, and will there be any substantial benefits? Pedro Ballesteros: I want to reply to the question. And I want to be very very clear. We are in a world that is suffering two big problems at least, one is called climate change and the other is called shortage of natural resources. We, in Europe, and in America much more, have been living for many years as if the rest of the world did not exist, we have been using a lot of natural resources to create a certain lifestyle that is extremely intensive in the use of those natural resources, I mean oil but I also mean water, land, and many other things. Now because of globalization and because of many things China and, in a few year time, India are in a position of developing quickly; which is fair and which is logical because China was poor and it is not fair to be poor. The problem is that the model of development you are taking is a model that is imitating us ! In our good aspects and in our bad aspects. The world cannot afford this, and we Europeans, we need to do whatever is necessary to change our lifestyle, to be dramatically less intensive in our demand for resources. We also need to serve as an example to rest of the world. This is the first thing. Second thing, we need to discuss with you, we need to work with you in such a way that hundreds of millions of Chinese people that are coming to the cities, have a life with dignity, possibilities, with perspectives but that is not so stupidly intensive in the use of energy and other natural resources as our life is because otherwise we will be in the same scheme of the 19th and 20th centuries nation state and we will go to conflict and nobody will have a good quality of life. There is simply no oil, no quality of environment, no water on Earth for this, and you know that in China, how many millions hectare of Chinese soils are already contaminated because you are producing so many things? Our major interest is that China, that is one of the largest country on Earth, is a stable country, developing peacefully, with millions of people having their perspectives and illusions being fulfilled here. For us priority number one would be to help you by sharing information, We are a continent whose population is not growing, it is going down, our relative weight at the world level is decreasing. This is the most important reason for the European Union to be here, to continue to be here for many years and to help you with our heart and our possibilities because we are firmly convinced that the survival or the European Union absolutely depends on the good model of urbanisation in China. What can the EU offer? Apart from our experience, and our experience is a lot, hat can we offer? We and the colleagues of CCUD of NDRC, are developing a partnership on urbanisation. This partnership on urbanisation intends to be a broad platform upon which we facilitate the creation and the development of a number of partnership. We are all very much confident on in the possibilities to be developed by city twinning’s. We are also very much convinced by the need to develop pilot projects, and demonstration projects. We are working on these issues, we are preparing a big China–European Union urbanisation forum, which will take place I hope in the month of October, in Beijing, and in which all of this is going to be brought together. We are going to discuss about cities upon different perspectives; the social perspective, the green perspective, the technology perspective, and try to get solutions for this. We are not going to come with a formula, or a magic solution, no, we are going to come with a panoply of examples in which each city, each decision maker will find their own solutions. This is our ambition. I am an official, my role is to serve the public not to provide ideas so, as such I think that our joined activity would be to facilitate for you and many other people to get involved in this, generate these ideas and go ahead, because it is really important what we are dealing with. Question 5: How do the European guests look at the government-led urbanisation? In the European urbanisation process, were there any cases in which government forces had vigorously promoted or were involved in the development of urbanisation? For the new round of urbanisation in China, what aspects should the Chinese government promote? Pedro Ballesteros: I fully respect the role that the Chinese government is playing. In Europe we act differently, the important thing is once we are sharing information it would be good to find out many other solutions. In Europe land is private, but in China land is public, this is a fundamental difference for any kind of plannification, we have a lot of experiences on urban planning but none of them is at the scale of this. Pierre Calame: I would like to give some final remarks on what we can expect from a EU-China cooperation. The first level I mentioned is being conscious that we are addressing the same challenges. When Europe was created, just after the war, Jean Monnet, who was the father of Europe said, when he was with German and French people who had fought each other: “we do not sit on opposite sides of the table, we sit on the same side of the table and in front of us is the challenge we have.” It is exactly the situation we have with China and Europe, we have to sit on the same side of the table and say: “there is no predefined solution on sustainable society, sustainable cities, we have to build that, and this is a common challenge which unites us over the resentment of the 19th century history and so on”. This is our historical duty. Now how can we do that practically? What is a strategy for change? Strategy for change is like strategy for peace. You are facing an enormous number of priorities, to face them there is one answer: try to understand not just from brains but from experience what is important. For example I listed in my own speech the major move to make. This kind of list seems very simple, and in terms of strategy it is absolutely necessary to draw a short list of what will be important to change. Then each point is described very easy to say indeed, but very difficult to do. So for each one, what is your experience, what is ours, and how do we move to the next step? After having faced this problem, found solutions exchanged experiences what are the new difficulties we are facing together? it is a practical way step by step through confronting experience, understanding what is really difficult. For example, like Maurizio described, how do we articulate a global supply chain with sustainable cities? Very simple to ask for, but it comes to concrete experiences to define what sustainable supply chain is and then build answers step by step. This is the concrete way to cooperate in the long term. My speech concerns the interaction between urban transition and innovation and new technologies. First, urban transition is highly demanding in new technology and new innovation. Second, new technology and innovation will progressively transform the context in which we are living, and thinking. It will help to develop new potential for organisation and for population, it will help us to achieve more sustainable cities and to go further towards sustainability. Third point, the relation between urban transition, large cities and innovation is that the potential, the talents and the organisations that can deliver these technologies are mainly located in these large cities, these are the universities, the research groups, the large companies’ research groups and all the networks of small and medium enterprises innovating to deliver new products. I would like to share experiments of our company. The First one is a EU-China project in the field of mobility management. Mobility is a concept in urban transportation which relies on multi-modality, it means that we need to develop several transportation modes in cities since we need to combine them even during a single journey, and this is called inter-modality. For example, walking in the street, taking the bus to the next metro station, and maybe the bicycle to go to the office and so on. So how to combine multi-modality, several transportation modes and inter-modality in a single journey? The third important point in mobility management is ITS we have to develop new infrastructures, new systems, but we mainly need to develop information system to organise the cooperation, the management and the optimisation of the transportation offer. In the mobility concept, citizen will much more focus on service. They need to go from A to B within a given amount of time and they want to find, given a budget or given some constrains, the best way to achieve their target. This is a service-oriented concept. Everybody working in this domain expect to find, thanks to the mobility concept, the right balance between private transportation and mass transportation at every level: efficiency, CO2 emissions, environment, comfort and so on. We have been working in Shanghai, within a European project and we had to transfer the European experience from Europe to China. In Europe we have a set of standards to define what is public transportation, this is a trans-model, and we have sub-standards like “SIRI, IFOP, NETEX” to define real time communication language, to define the infrastructure of the public transportation or to define public transportation services. All this has been done in Europe and is available for other countries. We can share this experience. In Shanghai thanks to the Shanghai Comprehensive Institute of Transportation and to the local transportation companies we have implemented a prototype of all these standards, Germany, France, United Kingdom and many other countries have more than a hundred years of experience in public transportation and they have recently decided to set up standards at the European level: ”Transmodel, SIRI, NETEXT, IFOP” these are the standards which are available and which represent all our accumulated experience. Another experience we have currently in China is about pavement technology, you can say that pavement is not urban development but let’s think about supply chains: you need to have highways to bring all the goods from the rural areas to the cities, you need to develop efficient system because if too much money is spent to set up and manage a highway network, this money will not be used for hospitals, for schools, for entertainment and so on. So there is a connection between the road policy in a country and other policies. China urgently needs such technology because traffic is growing, and Chinese authorities, with whom we are working closely, are facing some difficulties to build long term pavement highways. This technology is available and we can transfer it to China. But one of the important points, one of problems we are facing is that people are ready to accept the technology but it is very difficult to speak about know-how transfer. Not because of the European side, we are working with people who are open to transfer, but we realise that it is not so easy with our partners to speak about know-how transfer; because people think that by getting the technology they get all the experience. Clearly this is not the truth. We think that standards constitute a good platform to support cooperation and technology transfer between Europe and China, but we have to be careful because, at the same time, standards are very good barriers between countries. So we should encourage cooperation between the standard bodies in Europe and China to keep open this communication channel. The second point is not just about technology transfer, it is about experience and know-how transfer and this needs time, this needs for the partners to trust each other and so it needs a lot of pedagogy. Third point, everybody agrees that on Earth we all have responsibilities about climate change, sustainable development, but it is the responsibility of the governments and of the large organisations to provide the right business models. Because it is not easy for a small company, having some technology, to have the good environment and the good context to come to China. There are other difficulties in transferring this technology and speaking of urgent challenges, we have no time to loose in this process, we have to encourage the development of incentive business models for cooperation between small and medium companies, research institutes and from Europe to China and China to Europe. The title of my speech is Urban Transport, Mobility and Sustainable Development. China’s urbanisation has made great achievements, but at the same time we also see that China’s urbanisation is largely based on high consumption and heavy pollution. The durability of this mode has greatly affected our quality of life. Over the past 30 years, there have been a lot of good suggestions on urbanisation development, such as the construction of new districts, new cities and towns, bigger houses. Those good intentions might not necessarily lead to good results; a lot of invalid even wasteful results have emerged. For example, cities become more and more beautiful, but lack energy and vitality, and children are even rarely seen in some cities. How can a city without next generation be sustained? Having clean water and air, is a basic requirement, but pollution caused by China’s urbanisation makes almost everyone believe that it is the time to rethink our mode of development. In the process of urbanisation, the lack of effective management would inevitably cause global environmental problems and the deterioration of the urban environmental quality. In response to this, what should we do? A great number of new districts overly rely on cars, because urban development is being guided by personal cars. Many cities are conducting smooth traffic project in order to facilitate for cars to go faster. Within one or two years, the results might be favorable and positive, but after that there will emerge unbearable urban headaches of pollution and congestion. In addition, the Lake Malaren International Conference Centre where our meeting is taking place now is a typical new district of China, with big houses, large roads, a blue sky and green trees, but public transportation here is really not satisfactory. If we take an old district and a new district in Shanghai for comparison, it can be found that the construction of a new district means an increase of personal cars. It is more and more difficult for people to travel on foot. Is it an expected mode? No matter what kind of cities is concerned, I think there are three basic metrics: the first one is the energy consumption, is it possible to consume less energy? The second one is the heat, is it possible to generate less heat, and that is to say is it possible to reduce the heat island effect? The third one is the weight, is it possible to use a light pattern to solve problems, which means to reduce the weight of materials consumed in the process of urban construction? If a city is always torn down to rebuild, or always employs large structure, it would inevitably lead to huge material consumption, and increase the weight of the material cycle. Why is transportation so important? Because it is related to urban spatial structure, housing, office life and activities, and carbon sinks. Urban transportation though related to carbon dioxide emissions, is nevertheless important for urban development. If there is no convenient transports, a city cannot be well developed. We have also seen that transportation modes such as cycling and walking play a key role in many European cities, while many Chinese cities ignore them. It is often observed that urban planning in China seldom considers the role of the bicycle while in many foreign cities, transportation planning would first consider how people travel by foot and bike rather than by car. So, my conclusion is that a fundamental change needed in researches on urban transport is the shift from “car-orientated” resource intensive city to “people-oriented” green urbanisation. We are now in the critical period of the establishment of an urban spatial structure and a new transportation system, the realization of green urbanisation needs the overall techniques and strategies. I am going to try to study the role of urban public services in Europe and also in China. What are urban public services? Public services in Europe are services considered as being essential for life, for which public authorities, national, regional, local authorities and now European authorities define particular roles to guarantee universal service and universal access in order to build economic, social and territorial cohesion and also to develop sustainability. In Europe there is a very long and strong history of autonomous local authorities, such as the charter of Local Self-government from the Council of Europe and in this field towns and urban development play an essential role. There is not a definitive list of urban public services established, here are some examples: water, sanitation, solid waste collection and treatment, local public transportation, sometimes electricity supply, but also now broadband access, social services like hospitals and nurse services, childcare, elderly care, etc. We have for 30 years now a European integration in the field of urban public services. There are shared competencies between European Union and member states and when we say member states there are not only national authorities but regional, local, municipal and European authorities. I think we have now six main changes to manage in Europe and maybe also to manage in China regarding urban public services, environmental and social sustainability. The first one: traditionally, in Europe, there were local authorities with own established competence, for example municipalities were responsible for water and sometimes sanitation. There were in history, specific and exclusive competence. Now it is clear that we cannot manage services only with exclusive competence, we have to define a multi-level competence and governance. It is a revolution in Europe to combine local, regional, national and European levels and to try to define the best way for each service. Multi-level governance is the first main change, it is not finished, we have to implement these new rules and these new definitions. Second change: for each service, we have to define, and to try to combine economic and social tasks. Of course we know the ancient definition of these tasks but now we need to include environmental and ecological tasks to the social and economic ones, we have to define new goals, new tasks and new services. Third one: in Europe it is necessary to try to define territorial organising authorities, cooperation and relationship. We need to develop cooperation relationship and partnership with other levels; with districts, with metropolitan areas and also with European level and combine them. The fourth change we have to manage in Europe: multi-level governance is not competition between authorities, it is not competition between national, regional or local even European, we have to try to organise, to combine and to make converge the different local authorities and national authorities by linking levels and projects. This requires the participation of all stakeholders, we cannot reserve one activity, one service to a specialist, we have to systematically organise participation of all stakeholders. Fifth change: since the 80s, 30 years ago now, we assist to the development of many kinds of public-private partnerships in all fields. There are very big changes in this field. I made a study that few specialists made, it shows that there is no systematic superiority of one mode of governance, we have to find the best way for each service to combine maybe sometimes only public authorities, sometimes public and private ones and to combine their initiatives and their means. So the main issue in this field is to develop regulation and democratic participation of all stakeholders. It is not only about defining and asking private companies to do something but also about organising real public regulation and participation of all stakeholders. The sixth and last change we have to manage in this time: multi-level, multi-actors governance is based and will always be based on needs. So we have to organise the users’ needs (all users, each individual but also collectivities, industrial and economic users), and to organise the expression of needs and of change of needs. Needs are not defined once and for all. We have to satisfy the needs and to define for each sector not only one solution, not only the best solution from economic or environmental perspective, but to organise alternative solutions and to organise public debates with all the fields of all the possible solutions. We also have to evaluate what we have done, what the result of the activity of the service was to have a sort of loop “needs-organising-evaluation” and then to combine every of them to have a better answer to social and environmental needs. The Study on Population Migration and Quality of Urbanisation is the result of extensive researches conducted by our team in recent years. In the study, we made the following three theoretical hypotheses: advocacy of social policy and urbanisation rate are positively correlated; urbanisation speed and urbanisation quality are negatively correlated; urbanisation quality and quality of life of the migrant population are positively correlated. Since 2003, Chengdu has vigorously promoted the co-ordinated development of its urban and rural areas. In seven to eight years, the city has a newly added population of 2.71 million, becoming a mega-city with a population of 14 million. According to the current government planning, Chengdu would have a newly added population of 3 to 6 million in the next 20 to 30 years. From the perspective of policy frequency, Chengdu had formulated 28 documents on urbanisation from 2003 to 2011. In 2011, the urbanisation rate of Chengdu was 16% higher than the national average level over the same period, and 26% higher than the level of the provincial cities. However, quality is more important than speed. We proposed an Index System of Urbanisation Quality (ISUQ) with 29 specific indicators from four aspects to measure the quality of urban development, including the quality of economic development, of social development, of resources and environment and of life. To be frank, while the size and scale of Chengdu keeps expanding in recent years, the quality of its social development is worrying. For example, although the social security and social welfare system continue to improve in Chengdu, the newly added population of over 2.7 million coming from rural areas cannot enjoy the same education, security and social welfare as urban citizens do. More importantly, when the city is highly developed and maintains a certain size, it would not be a good sign if the urban-rural gap continues to widen. I believe that there is no single city throughout the world in which the central area is more and more prosperous, while its surrounding communities and rural areas are decaying. In terms of resources and environment, with the advancement of urbanisation, the coverage rate of green areas in developed land areas and the compliance rate of industrial sewage discharges are lower than the urbanisation rate in Chengdu; the rate of harmless disposal of household garbage tends to be fluctuant; the urban sewage treatment rate is increasing, and the per capita arable land is decreasing. Some mayors said that in accordance with the current rate of development, urban land in their cities would soon be depleted. Then what should we do in the future? We have no idea. Here are some conclusions. First of all, China enters a critical urbanisation period. There are growing concerns on issues such as the speed of urbanisation, population migration scale, survival condition of migrant population and urbanisation quality. If there are no systematic measures for urban development in terms of concept, design, construction, monitoring and test of the quality management, then the future is worrying. Secondly, the migrant population faces problems such as employment, living, children’s education, social security, adaptation and integration into the city life, values conflict with locals and so on. City governors face problems such as the quality of urbanisation being restricted by excessively gathered population, the bearing capacity of the population, resources and environment, the economic development capacity, the fair development of people in different class, etc. We proposed an Index System of Urbanisation Quality to measure the quality of economic development, social development, resources and environment and people’s life in the process of urbanisation. Finally, I would like to share my reflection on the EU-China dialogue. Based on its seven-year achievements, the China-Europa Forum is also facing the challenge of transition. In the future, the CEF should not only continue making dialogues, but more importantly focus on actions, practices and concrete projects. For instance, we could consider establishing links between a Chinese city and a well-developed European city which had similar experiences. Then relevant studies could be conducted on the specific problems of a specific city, which may offer more practical implications on policy making and guide the actions. These are my expectations. I speak on behalf of Mr Anders Wollter the Minister Counsellor and the Head of the Department for Technology, CENTEC and the CSR centre at the Swedish Embassy in Beijing. It is a great honour to participate to this important China International Urbanisation Forum and to be part of all the distinguished participants here at the beautiful panel town of lake Malaren which is actually named after one of the biggest lake in Sweden, Mälaren, a lake in the region of Stockholm which has been integrated in a natural way in the city planning, in the biggest urban area in my country. Sweden has a unique competence in environmental technology and systems solutions on urban sustainable development. We are also regarded as one of the world most innovative countries. Urban planning and architecture, urban transportation, urban agriculture, energy planning, waste to energy, biofuel, energy conservation, and last but not least environmental protection. Our areas where innovation and knowledge make our eco-cities sustainable and greener. The CENTEC promotes partner-driven cooperation and exchange in the field of sustainable urban development and environmental technology. It involves both institutional and commercial areas of cooperation even on provincial and local levels, by doing so we combine the promotion of businesses with development cooperation. The working method is based on a holistic approach to stimulate and to support the various actors to self-supporting cooperation. The Swedish full scale implementations for eco-cities are attracting much attention here in China. We receive many high level delegations in Sweden who want to see our leading full-scale solutions for example Hammarby Sjöstad, placed in the outlet of Lake Mälaren in Stockholm but also the western harbour in Malmo a city in the southern part of Sweden. More than once have the Chinese delegation told us, on the spot, when they visit these places, that they want to buy this immediately. But we say to the Chinese delegation that they cannot actually buy it but we can tell them how we have done and share that lessons learnt with them. It is all about city planning and the capacity to implement large comprehensive, complementary and cooperative systems. Processes also include involving local stakeholders and eventually the end users. Such solutions cannot simply be bought straight of the shelf in a boutique, but we can promote and share our experience with inter-institutional dialogue, policy dialogues between Sweden and Chinese cities as well as professional in-service training and commercial partnership. The eco-city of Hammarby Sjöstad a Swedish planning model and project, but the technologies in the final product are distinctly European. A very rough estimation, yet a quite clear indication is that the hardware in Hammarby Sjöstad might be 10% Swedish, and 80% comes from the rest of the European Union. So the conclusion is that we cannot simply, as maybe tempted to do, talk about competition between different EU countries, it is certainly also a question about combining different technical solutions to large systems. The question is how many different sorts of pulling on the European side could work for the benefit of sustainable urbanisation in China and for increased Sino-European cooperation in different forms. When it comes to establishing partnership for sustainable urban development in China, we, and several other EU countries, experience that it is relatively easy to get into participation in an early planning stage. The Swedish consultants have won a series of contracts in China and that is good but we can go further. And the question is, to what extent this can be done at a European level? Let’s conclude by talking about the challenges, because one challenge in promoting sustainable urbanisation in China is in going beyond the planning phase into the implementation stage, for example to cooperate with Chinese system suppliers following the original plans, intentions and system solutions or, as the project progress, widening sustainable solutions against economies to cut corner or to save money. Saving and cutting corners are not bad, in fact it is often quite good, but the European approach today to handling scarce resources still often involve the deployment of advanced solutions that a phase value made costly. There is a considerable potential to let European experience part of the process implementation to certainly benefit China endeavours and long-term functioning of new urban systems. Here arises the question of how can the European Union best share our experiences with China in the implementation of projects for sustainable and urban development and eco-cities in order to get sustainable final products? Trade promotion is by EU member states regarded as a national concern while in development cooperation it is easier to create multi-national consortiums which also involve the European Commission. So the question is here, how do we now work together in the best possible way to create an effective integrated approach on an EU level on the one hand and for member states’ actions on cooperation and trade promotion on the other? XIE Zhongyan mainly introduced the urban development of Changbaishan. He said that in the urban design, Changbaishan was aimed to be built as a world-class tourist destination. The Changbaishan Nature Reserve has three economic zones: the northern lake (the Tianchi) economic zone, the western lake economic zone and the southern lake economic zone. There is an important headstream on the Changbaishan Mountain - the Changbaishan Tianchi with a water storage capacity of over 2 billion cubic meters. Planners made a systematic urban design: first, to establish the continuous ecological infrastructure; second, to introduce and develop eco-tourism and urban economy. My presentation is about the interactions between national policies and local policies to help sustainable development. We have in France, five political levels. France is an old centralised state, at the origin, mayors, and all the local authorities were appointed by the central government. Nowadays there is tendency to decentralisation.. The European Union is 27 independent countries in a Union in our diversity, and in France we have now 22 regions, 100 departments and 36 thousands communes and each level has its own political autonomy. (…) We have three modes of relations between public authorities: the grant, the rule and the speech. Each level can give subsidies to lower levels, for example for sustainable development project. Most of environmental rules come nowadays from the European level and involve controls and sanctions. We have indicative planning and recommendation and the three modes can operate simultaneously on an operation. For example for the clearness of water, we have a directive from the European Union, from the year 2000, that directive compelled the member states to meet definite level of clearness of water before 2015 and it is a law controlled by controllers of the European Union. If the performances are not achieved, the State must pay strong penalties to the European Union. Then the French state has made a national plan of action, it is only speech, it is not compulsory, and there is no control and no sanction but the State has no certitude that municipalities will fully fulfill the performances. Then the State gives subsidies to municipalities to incite them to build new purification plans and there is a control of the use of the grant. Another example in climate change mitigation: we have in Europe, a four year European strategy for sustainable development and in France too, a French strategy for sustainable development with precise objectives and targets. Notably about climate change mitigation we have to reduce our emission of greenhouse gas of 20% by 2020 and 75% by 2050. We have to develop renewable energy up to 23% of the mix by 2020 (we had only 10% in 2000) and for that, in France, we make regional plans for climate, air and energy. Each region produced a plan before 2012 for climate, air quality and energy, defining a strategy and operational targets for the region, defining an action plan and defining a system of control and assessment of the result. My region for example, Burgundy, produced a beautiful document in 2011 in which you can find for example, the distribution of the wind turbine areas in Burgundy. Wind turbines cannot be planted in towns or in beautiful landscapes, they are planted in areas with wind strong enough, without urbanisation, without technical difficulties and without ecological difficulties as beautiful landscapes, birds, etc. Then we have to take the stakeholders into account, public authorities are not the only actors of sustainable development, the responsibility is shared between public authorities of each level (five levels), economic actors, social actors, civil society and non-governmental organisations. Each partner has to negotiate with the others, to share information and points of view, to build solutions that could be admitted by all stakeholders and therefore that can actually be achieved. Then we had a big consultation in France, called “Grenelle” because Grenelle street is historically the area where we negotiate in France, a one year consultation between the State, local authorities, companies, trade-unions, and NGOs to think about the future of our planet. Five years after, now in 2013, a new consultation of the same form is taking place, dealing with energetical transition to update the orientations and action plans of the Grenelle. At the local level, local authorities cannot act today without discussing with local stakeholders. It is compulsory for each project impacting the environment, (and even if not compulsory they do it very often) because the success of projects for nature, for climate change mitigation, or for quality of life depends on the acceptation by each citizen and on the good coordination between all the actors. The governance of sustainable development is a very difficult issue, sustainable development produces new problems of governance, each actor holds a part of the problem and a part of the solution. In a systemic functioning, for the management of the common-good, greenhouse gas, gas mitigation for example, the immediate interest of an individual can be opposite to the interest of mankind in the future. Public authorities have to enhance a common awareness of rates and ways of solution. A lot of consultation and bargaining of various firms between the different levels of governance and between the various stakeholders at each level is needed. Welcome in our complex world! The title of my speech is Migrant workers should be integrated in a new process of urbanization. Migrant workers refer to people who are registered as rural household and go to work in cities. In the past, the definition was more complex, referring to a farmer who owned land in rural areas and went to work in cities. However, nowadays many migrant workers born in the 1990s have no land; many college students entering into the cities still have contracted land, but they are registered as non-rural household. This is China’s reality. As a result, we have to consider how migrant workers should be integrated in the new process of urbanisation. Intensive, smart, and green development are the three major objectives of the new process of China’s urbanisation proposed by many people, but it is necessary to explore whether they can be universally recognised and finally achieved. To address challenges faced by China’s urbanisation, there is no existing solution, international experience or model that can be directly applied to China. Chinese leaders put forward a new concept according which the progressive promotion of urbanisation would serve as a focal point to speed up the formation of a new development approach and a fundamental way to break the urban-rural dual structure. I am going to illustrate my argument from three aspects. First of all, China’s urbanisation must take an intensive way of development. In the next 10 to 20 years, China must establish a strategic orientation with a main development pattern of metropolitan areas, cities agglomeration and megalopolis, otherwise no existing solutions advocated by experts and scholars will realise a new development mode and ultimately break the urban-rural dual structure. It is a universal rule in the world that medium and small cities and small towns enjoy a coordinated development within metropolitan areas, city agglomerations and megalopolis. The coordinated development is not man-made, but a product of the combination of industry development law and urban layout. In the past, China’s urbanisation followed a development zone mode with industries and cities and towns being separated from each other. As a result, the development pattern of metropolitan areas, city agglomerations and megalopolis is not simply about further promoting large cities, but also finding an industrial adjustment mode within the framework of the existing pattern for the coordinated development of large cities, small and medium-sized cities and small towns. It is also crucial to find key areas for development and reform, and these areas should be the focal point to speed up the formation of a new development approach and a strategic breakthrough to break the urban-rural dual structure. Second, the international community holds different opinions on the so-called smart and green urbanisation. The development pattern proposed by Rifkin in his book The Third Industrial Revolution, basically refers to an urbanisation based on a new energy revolution and the emerging industrialization with the theme of the Internet of Things. At present, what could be directly connected to this concept is the urbanisation pattern in Europe which is based on small and medium-sized cities. However, for China, the United States, Japan and other countries whose main urbanisation pattern is with metropolitan areas, city agglomerations and megalopolis, it is obviously necessary to find new paths. Because there are basically no mega-cities in Europe, and even though there are a few big cities in Europe, their sizes are not comparable to those in China, the United States and Japan. From the perspective of new energy development, there is still a long way to go for renewable energies to cost less and be a popular market. In those countries with traditional types of energy accounting for an overwhelming proportion, resistance to their acceptance will be great. Because of its stage of development and its status at the primary level, and the low end in the international division of labour, China is in an unfavourable situation which is not conducive to innovation and even hinders the acceptance of innovation in terms of changes in labour costs, in resource prices and in the pattern of urban development and social benefits. For example, the Foxconn suicides in China (the scandal occurred between January and November 2010 when18 Foxconn employees attempted suicide and 14 of them died were not the result of individual business owners, but a product of multinational companies in developing countries, especially in China, in the backdrop of the global competitive mechanism of the division of labour. 200,000 to 300,000 employees gathered in an area of 2.3 sq.km, working, eating and resting in the same place, the density itself runs counter to the national standard of the reasonable density of 10,000 people per sq.km. However, who would follow this standard in China’s development zone mode? On the contrary, Foxconn is a law-abiding company in terms of labour law, corporate law, and labour and social security law, even more in line with the present legal system in China than a number of small and medium-sized private enterprises. The question now is that if China would extensively copy or follow the international legal standards in enterprise, labour, company operation, labour and social security and other aspects, its low labour cost advantage would be lost, and the good employment situation and the prospects for industrial development would be reversed. Nowadays, major changes have taken place or are taking place in the choice of environmentally friendly and low-carbon green products and technologies, as well as in the resources configuration of the traditional low-end products, the low wage costs, the land and even the financing environment. For example, China’s photovoltaic industry suffered heavy losses during this crisis, indicating that with changes in the market, the resources and the environment, new industries will also face serious challenges and the possibility of restructuring. The international community is exploring new modes too, and what kind of mode should China look for? Third, the remodeling of demands in the international community differs than the one in China. Demand for innovation relies on high-income consumers. If there is a strong support from the middle-class, this demand would find a vast market, particularly in the convergence between smart and green-based innovation demands and the upgrading of consumption and supply. However, China is currently in a transition stage where a large number of low-income groups are moving towards the middle-and-high-income groups. It is still difficult for such groups to quickly accept the smart and green-based innovation demands, thus resulting in consumption discontinuation. A more critical fact is that many low-income people in China (in 2011 the total number was approximately 210 million, accounting for 1/3 of the total urban population, and 19% of the national population), especially the migrant workers are supported by the exports of labour-intensive products; and the basis for maintaining their stable income source would inevitably require the long-term development of traditional industries. It is the difficulty for the adjustment, transformation and upgrading of the industrial structure of all countries. The difference is that one of the reasons for the formation of low-income class in developed countries is the export of labour-intensive products produced by the low-cost labour in developing countries which have a strong impact on industries and job market in these developed countries. This round of financial crisis requires a rebalance of the global economy. One of its priorities is to deal with the income of the low-income class in different countries and the industrial transformation since the previous round of globalization: the main problem of China’s low-income groups is the extremely insufficiency of social security, while the problem of the so-called low-income groups in developed countries is the excessiveness of social security. The key to the whole issue is to know whether or not these two types of low-income groups would generate normal convergence of supply and demand in the new round of smart and green-based innovation demands. The dilemma faced by China is either to significantly improve the social security of migrant workers or to support technology innovation in emerging industries. At present, the developed countries’ support of low-carbon technology and innovation funds to the developing countries is at the expense of the high-value transfer and the commitment to verifiable emission reduction obligations. This forces those developing countries to conduct independent research, to develop low-carbon technologies and to deal with problems and challenges in the transition on their own. Therefore, in reality, whether it is to export smart and green products to China, or to transfer the technologies of these products, or even to make direct investment in China to develop technologies and produce products, it is necessary to take the reality seriously: China has a low-income group represented by a huge number of migrant workers. The new process of urbanisation cannot be realised without construction efforts for migrant workers, and their income and employment transformation. It is important to make hundreds of millions of migrant workers become the backbone to enrich the new middle-income groups. We need to have not only inclusive growth, but also inclusive innovation. In addition, I would like to say a few words about the household registration system (the hukou system). Many participants in this two-day forum considered that the ultimate purpose of the new process of urbanisation is to abolish this system but I think it is a deviation to have such high expectations on it. I think we should gradually play down the role of the household registration system in this process so as to advance the reform. I will present briefly Geneva’s implementation of industrial ecology principle as well as the work of a company called “solution for industrial ecosystems” and you will see what they did in Geneva. Geneva is a small city of less than 500 000 inhabitants but quite dense, really reliant on its importations, it is a rich city with an economy mainly dependent on services. I will define briefly what industrial ecology is: it is a concept and an academic field, it is the combination of the scientific study on ecology and industry, industry which relate to all human activities and economic activities. The goal is to make industrial systems compatible with natural ecosystems. In practice it means that we will try to use resources more efficiently and try to valorise waste, namely the waste of one industry will be the raw material of another industry. This academic field has developed in the 90s and Geneva was the first city to integrate this concept in its regulation. What did Geneva to implement this principle? The first thing was to better understand Geneva’s industrial metabolism, we have to understand what the material flows are in the city of Geneva to be able to correct them or to modify them wisely. So we need a physical accounting of the most important material flows such as energy, food products and water in the city of Geneva. The second step was to do a study on transportation, a study to identify the potential industrial symbiosis in Geneva, and to communicate to with the public. We divided between production, consumption and elimination of waste, and you can observe that water along with building materials and energy are the most important material flows entering the city of Geneva. It is difficult to compare energy with material flows but if we make a simple comparison, we can say that 37 thousand terra joules of energy that enters into the city are almost the same as 870 thousand tons of oil equivalent, so it is the third most important resource that enter into the city of Geneva. Recycling is only a very tiny part of waste generated by the city of Geneva. Then in this first idea of the industrial metabolism, we have to identify major consumers and as you can see from this chart, households are the main consumers of water (42% of the water consumed in the city) and you can observe that the tertiary sector consumes a lot of resources, 45% of food products. These are the two main sectors where we need to find solutions to reduce the amount of waste. Another aspect of the industrial metabolism is CO2 or greenhouse gases emission. The second study on transportation of goods in Geneva showed that transportation of goods to the city amount to 1/10 of the CO2 per capita in the city, so it is a major point if you want to cope with these problems. Another study was about the potential industrial symbiosis that can be found in the city. An industrial symbiosis is when two different industries try to exchange their waste so the waste of the first industry will be the raw material of the second industry. When realising that kind of symbiosis, the distance between the first industry and the second one is really crucial. This is the principle which is at the heart of the eco-industrial parks, China has developed a lot of eco-industrial parks, but in the case of Geneva, since the city was already there and they did not want to build a new park, they had to find ways to implement such strategies with the existing industries. One first example with energy, when we talk about energy it is mainly about heat, how can you valorise the heat that is eliminated? How can you use the heat which comes from vapour production or construction materials production (and you need a lot of heat to produce that kind of products)? We realized that you can transfer this heat to distant heating systems to heat for example greenhouses, households and so on and thus valorize this kind of energy. The other potential industrial symbiosis would be in the water sector because water is a very widely used resource. We mainly use it for drug manufacturing, food-processing, or manufacturing construction materials. This water has some impurities or sometimes it is warm water but it can be useful for other industries, for example in the case of agricultural production greenhouses, orchards could be interested in using this hot water. There is also the case of green zones for auto-sport facilities which can use the water to water the green zones, and the case of waste recycling companies that use a lot of water to wash the waste before recycling them, both can also be interested in using the water that has been used from other industrial processes. That was the study part, another important step in implementing industrial ecology principle, it is to communicate and to explain to the general public what you can do with that. All the studies are available online for Geneva’s citizen and there is also a general presentation of what has been done in English and in Chinese on the website. I will talk about three questions. The first one is the challenge of land issues. The urban development requires a space for growth which will occupy farmland. Will China’s urbanisation have such space in the future? I think, we have to change the development mode with more intensive and smarter approaches to meet the needs of urban space. Will China’s urbanisation pose threats to the global food market by occupying farmland and affecting food production? I think we do not need to worry about this issue. Although the past decade witnessed the most rapid urbanisation development and the fastest urban spatial expansion in China, our food production keeps increasing for nine consecutive years. However, it is noted that in the process of food transportation, consumption and so on, food waste is a very serious phenomenon. Food waste in China is equivalent to the total production of about 32.9 million acres of land each year, an equivalence of a year’s grain output in Heilongjiang Province. Therefore we have very a large space in food conservation. The second one is the urbanisation of the population, which means the transfer and relocation of the rural population to cities. Urbanisation is an inevitable product of economic development. The stage and level of economic development, the economic structure and the endowment of natural environment have an impact on the level and pattern of urbanisation. In the process of urbanisation, migration of people is a very critical aspect. Urbanisation and economic development are closely related. If some policies and systems have impacts on urbanisation, urbanisation would in turn affect the sound development of the economy. (…) What we are more concerned about is the issue of the urbanisation of a large number of migrant workers. Undoubtedly migrant workers are a group with a huge number, but I think there are more obstacles in the interregional identity conversion than the conversion from a rural identity to an urban identity in China. For example, the Institute of Planning where I work has been disrupted by the household registration issue when employing new staff members. Even if you are a Shanghainese and hold the PhD degree, the Institute can hardly hire you because you do not have a Beijing hukou, let alone a migrant worker. I think the reform in this regard should take the lead. Third, how many people can be urbanised? In some parts of China, rural areas have been hollowed because a large number of labour forces have left to cities to make a living. There might be nearly 20% margin for China’s urbanisation in the future, and it would be a new topic of these people’s integration into urban areas.